Glass Gifts. Bridesmaid Pendants, Kids Magnets, Jewelry, Home Decor including Glass decoupage coasters, plates, earrings, keychains, rings, pendants, magnets, Czech glass buttons and mirrors. Find unique glass gifts. All my items are either handmade by myself or used as supplies for my own artwork. I love glass and color. Enjoy! 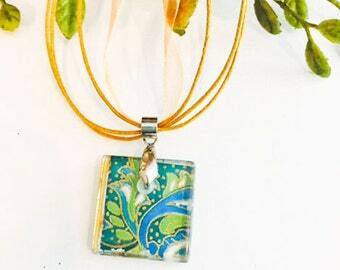 Green Pendant, Green Glass, Chiyogami Pendant, Glass Tile Pendant, Bridesmaid Gift Jewelry, Green Paisley, Necklace with Ribbon and Cord 18"
Welcome to my shop and thank you for taking the time to check out Bella Vetro. All items are handmade to the best of my ability. There may be minor imperfections due to the nature of the process. If you are not satisfied, please let me know! All items are shipped via USPS first class mail. All shipments include delivery confirmation. Items are shipped within 2 business days of payment.